Not pretty. From a strategic point of view, it would be unwise to telegraph to the Japanese that U.S. troops were on the way. The profile in tight lips was key to retaking Attu, 19 days, 4,000 men and a few hundred cases of frostbite later. Our guides to this forgotten corner of World War II history are Bill Jones and Andy Petrus. 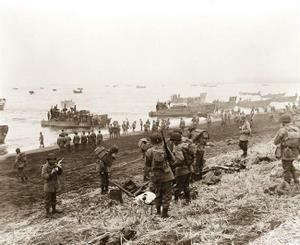 They fought together on Attu, as well as Okinawa, Leyte Gulf and a few other places. As they recount their experiences in interview segments and on the battlefield (which serves as a “living museum,” untouched since the battle took place) one gets a strong sense of dread at just how commonplace it can all seem in contrast to the battles that have become household names. Petrus and Jones do their level best to cure any misapprehension. When Jones prods his battle mate about the degree of horror involved in the Attu battle, they settle at the figure of “ten times worse” than what they experienced on Okinawa. We see the carnage of mountain fighting, the caprices of the Aleutian island weather, with its sleet replete hurricane winds and mercurial temperament, and the inhumanity on both sides, whether it be the Japanese meticulously killing the wounded in their sickbeds or the Americans gunning down surrendering enemies. The subplot, if you will, revolves around a large titanium starburst on Attu’s Engineer Hill. The monument, one of eleven that the Japanese government erected in 1987 as a gesture of contrition and commitment to peace, is an unwelcome sight to the two veterans. Jones is especially affronted. It is easy to see his argument, though the reasoning can seem a bit strange from a detached perspective. “They stole (Attu) from us, and they killed our men.” He continues, wondering how they display the audacity to put the monuments up, in conjunction with our own government. It is always a tricky subject, especially in such far-flung areas as Attu, which is 1,500 miles from mainland Alaska and only 400 from Russia. The notion of stealing a parcel of land is one in which we Americans are the blackest of kettles. That being said, I dare anyone to offer this bit of thought to Mr. Jones. Red White Black & Blue provides all the things a World War II film should, while boasting something tough to come by these days: a novel topic within the area of research. Petrus and Jones are admirable and engaging, though a host of interviewees pop up throughout the film whose backstory remains a nagging question. While it is an invaluable history lesson and window into two underappreciated heroes of our Great War, one can’t help but feel unevenness in the flow of the film. This would be hard to avoid, considering the dearth of footage available in this clandestine campaign, which, to Putnam’s credit, he includes what one imagines to be the lion’s share of said footage available. Possibly this perception stems from the approach RWB&B takes. We are used to World War II getting full Wagnerian treatment. This film has more of the feel of a Johnny Cash dirge. It would be flawed to focus on the construction of this work. After all, one cannot live by opera alone, and this technique is a welcome change of pace, asking us to focus as much on the actors as the play. This is always difficult when the subject is so large. In large part, RWB&B accomplishes it. Even if it didn’t, it would remain essential viewing if, for nothing else, informing the viewer of just where the hell Attu is. And what it meant. where can I purchase this film?